Are you looking to buy a new car or van and you’re not sure whether to lease or buy it? This article highlights key questions to ask yourself, to help you decide whether to lease or buy a new car/van. Prefer bespoke taliored advice to suit your business, then we offer a FREE fleet consulation, contact us now on 0845 052 5268 or complete our online enquiry form. In the past, car leasing has mostly been associated with large corporate businesses. But nowadays smaller businesses and self-employed people are also taking advantage of the benefits leasing has to offer. As are many private individuals. The concept of leasing is relatively new to many people - However they are aware of its popularity as a means of funding a new car. This leaves people unsure of the best way to finance their next car. Leasing and buying are very different. And what’s right for one person or business, isn’t right for another. Therefore you should ask yourself these questions before committing either way. 1) Do you want to change your car regularly? Leasing is ideal if you enjoy driving the latest cars and want to replace your car every two or three years. It’s great for businesses that want to create a successful image by having new cars and for high mileage drivers. It’s also good for private individuals who want to look good by having the latest car. 2) Do you want low monthly payments? If you were taking out a loan or HP to buy a car outright, your monthly payments would typically be more than monthly leasing payments. This means you can either save money, or you may want to take advantage of driving a more prestigious vehicle? 3) Do you want to avoid high depreciation costs? Brand new cars on average depreciate up to 60% in the first 3 years. With leasing, you are only paying to use the vehicle - thus avoiding ownership for the total depreciation costs. 4) Do you like trading or selling used vehicles? If you don’t, then leasing is ideal. As you simply hand your car back to the leasing company at the end of the lease – you won’t have the hassle of selling it or accepting a low payment in part exchange. At this point, most people take out another lease and enjoy driving a brand new car again. 5) Do you want a car which is always covered by warranty? A leased vehicle will always be covered under the manufacturer's warranty (providing the lease is 3 years or less and within the warranty mileage - usually 60,000). This gives you the peace of mind that if a fault occurs with the vehicle, it should be covered under the warranty. 6) Do you have a stable and predictable lifestyle / business? When you lease a car, you agree to lease it for a fixed period of time – usually 2 or 3 years. If you need to come out of your lease early, you may be charged an early termination fee. You also need to estimate your annual mileage as accurately as possible. If you do over your agreed mileage, you could be charged excess mileage when you return the car. If your circumstances change and you find yourself doing a higher mileage, you can amend your mileage during your contract. However this is likely to increase your monthly payment. 7) Businesses - do you want to free up cash flow? Leasing is a great way to free up valuable cash flow - Enabling you to invest money in other areas of your business. Also, if you want to free up your credit lines, off balance sheet funding is available with Contract Hire. This will help your accounts look like you don't have too many loans - freeing up credit for other things. 1) Do you expect lifestyle / business changes in the near future? If yes, then buying a car may be more suitable to you. With leasing you are tied into a contract, if your circumstances change, your lease vehicle may not be suitable anymore. Coming out of a lease early, can result in an early termination fee. 2) Will you be rough and demanding on your vehicle? If you don’t look after your car, then buying outright may be more suitable to you. Whilst leasing companies expect there to be wear and tear on a leased car, if there is excessive damage, you could be charged for this. 3) Do you like the idea of ownership? With leasing, you don’t own the car – you are simply hiring it. If you like the idea of owning your car, leasing might not be right for you. NB – with some leasing agreements (eg PCP & Lease Purchase) you have the option to own the car at the end of the lease. 4) Have you factored in depreciation? Depreciation is something you can’t avoid. It’s quite common for people who buy a car with a loan, to find themselves owing more to the finance company than what the car is actually worth. 5) Do you mind paying higher monthly payments? If you are taking out a loan or HP to buy a new car, your monthly payments will typically be higher than monthly leasing payments. This is because you’ll be financing the entire cost of the car, rather than just the ‘usage’ during your leasing agreement. 6) Do you want to drive the same car for many years? People tend to keep a bought vehicle for longer to spread the cost over a number of years. If you prefer to drive the same vehicle for many years, until you run it into the ground - then buying may be more suitable to you. 7) Do you mind paying for repairs? A leased vehicle will be covered by a manufacturer’s warranty (provided the lease is for 3 years or less and the car is under the warranty mileage). If you keep a car after the warranty has expired, you will be responsible for costly maintenance and repairs. Manufacturer warranties last for 3 years because they know things are most likely to go wrong after this point – this is something to consider. 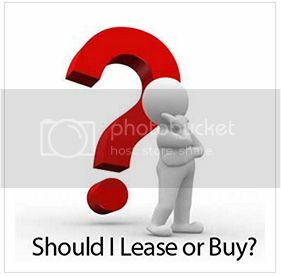 As you can see, whether you should lease or buy really comes down to you as an individual or as a business. It depends on your circumstances and what’s important to you. If you'd like to discuss the differences further, just give us a call on 0845 052 5268. We're a reputable and helpful leasing company - We take the time to find you the best leasing deals that are right for you. Why not contact us for advice on 0845 052 5268 or ask for a leasing quote?